I didn't know what to expect from Malaysia. 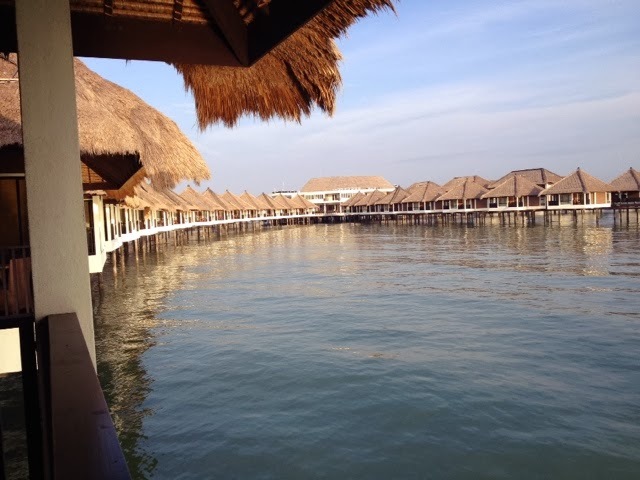 All I knew when we booked the Gold Coast Resort, on the coast of Sepang, was that the whole place is built on stilts! That includes the villas, the infinity pool, the restaurants, the spa...need I say more? From the plane all we could see approaching the runway, was vast forests of dark green, dense palm trees. I was surprised because we are used to the much taller and thinner kind, so I was impressed by the richness in colour. The same theme continued all the way to the resort, along with shorter dragon fruit palms, dotted with their bright pink produce. As a tourist leaflet mentioned, "don't leave your doors open and your dishes piled up in the sink; you'll find monkeys in your living room - don't forget, every inch of this area used to be a jungle!" 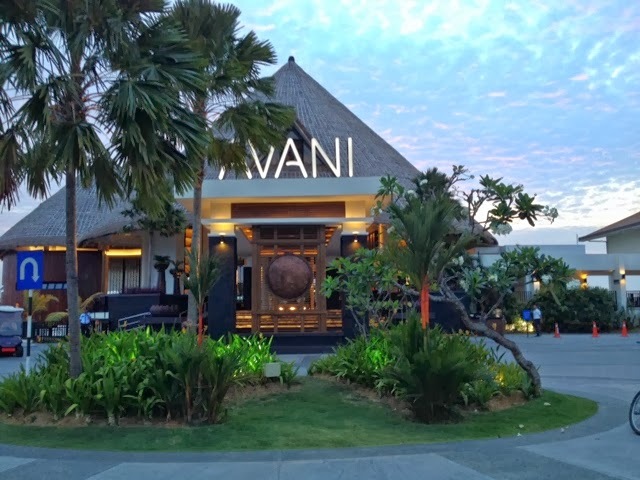 ﻿An advantage of this place is location: only 30 minutes form Kuala Lumpur airport, 90 minutes from Kuala Lumpur city centre . Shall we start calling it KL now, just like the locals do? We took the Air Asia flight from Singapore, great for short trips around south east Asia; it's what Easyjet and Ryanair used to be, cheap and convenient! But until the new airport is open in KL, prepare for a long, hot walk outside and a hot, long wait for immigration inside. The positive thing is that you get a visa at arrival if you have a British or European passport and there are no fees involved either. 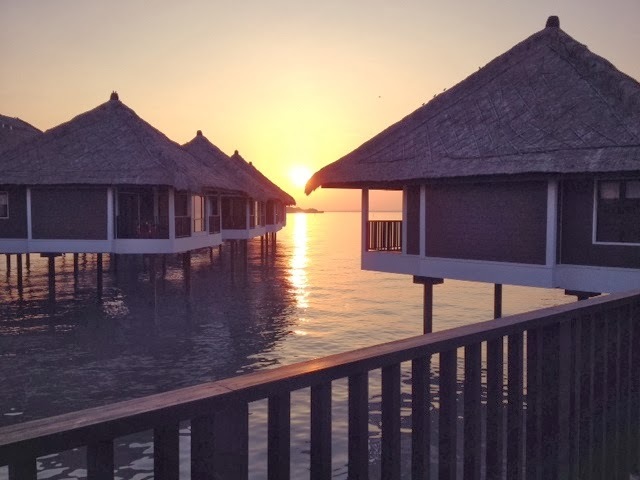 This resort is a good choice if you are popping over from Singapore or Hong Kong for the weekend or if you are attending the Sepang F1 Grand Prix. It is only six years old, well-planned, with a very cool layout of a palm tree. Try locating yourself on Google maps: you'll find yourself residing on a branch of the palm tree in the middle of Malacca Straights! Service unfortunately let us down a couple of times, in the sense that staff did do their jobs but did not go the extra mile. In hospitality industry adding that personal touch goes a long way, hence it is a shame that compared to the quality of the surroundings, this extra attention to detail was lacking. 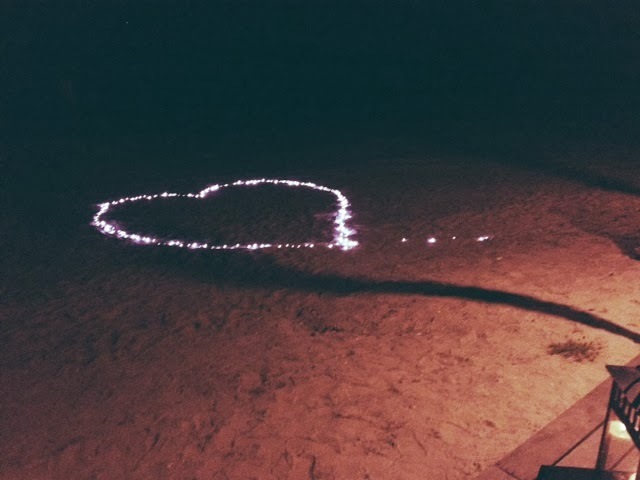 We had a great time but we felt that the resort could benefit from improved customer service going forwards. Apparently new management is taking over and things are looking up - they promised to take notice at the little things that make a difference. Once in Rome do as the Romans do, so...off we went for breakfast at 6:30 every morning, back to the villa for a midday siesta to beat the heat; bonus point: watch the magnificent sunrise over the golden coast...the hotel name kind of gives it away after all! Speaking of breakfast, prepare for a Pan-Asian feast. Japanese bento boxes assembled at your preference, Udon noodles, Malaysian curries, and fresh dumplings and off course fresh omelettes and waffles. Oh, and then there were the bikes! After seventeen years I can proudly say I can still ride the bike and it was fun. 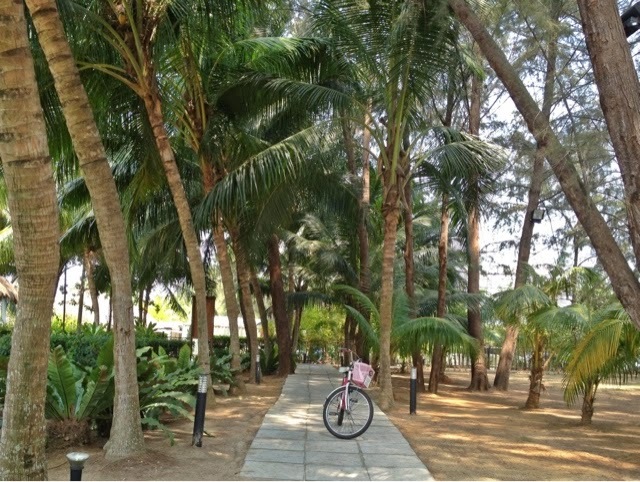 Moving around the resort in the heat can be daunting, hence the hotel provides buggies to drive you around or you can grab a bike and be on your way. Absolutely loved riding down to the beach in the mornings for a yoga class, before the heat settled in. 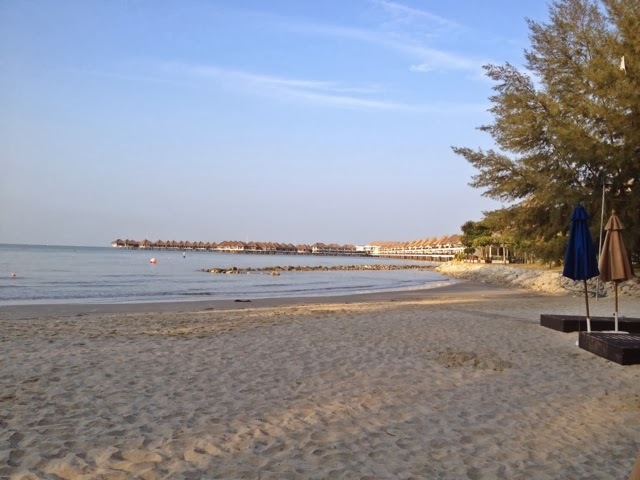 There is also Zumba, local bike tours and beach cart-sailing provided for the guests for free, throughout the day. It's quite thoughtful, as there isn't much else to do in the immediate vicinity of the hotel. 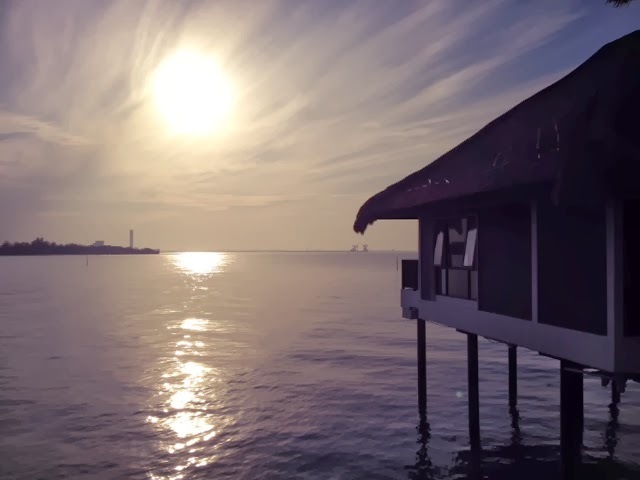 One sunny afternoon I took my bike and rode to the spa: an overwater villa with a view of Malacca Straights. Not your average spa location! 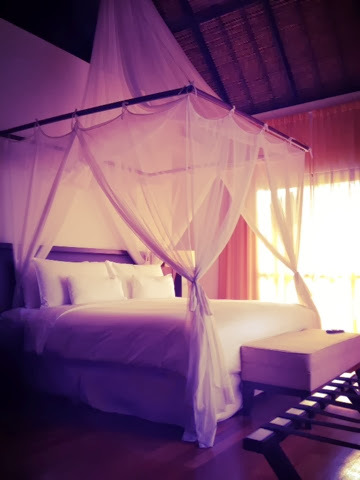 The treatments were carried out in a spacious room, with exposed beams and visible thatched roof - utterly liberating. I hate small and gloomy spa rooms that are meant to be cosy and relaxing but feel so claustrophobic. 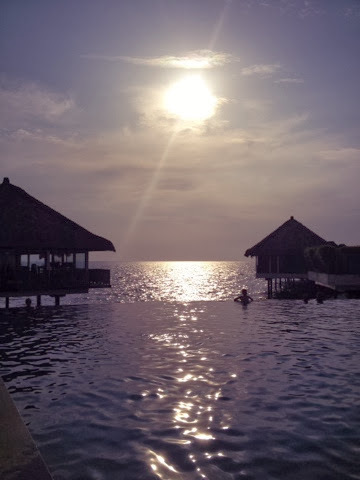 Then back to the infinity pool to watch the glorious sunset! 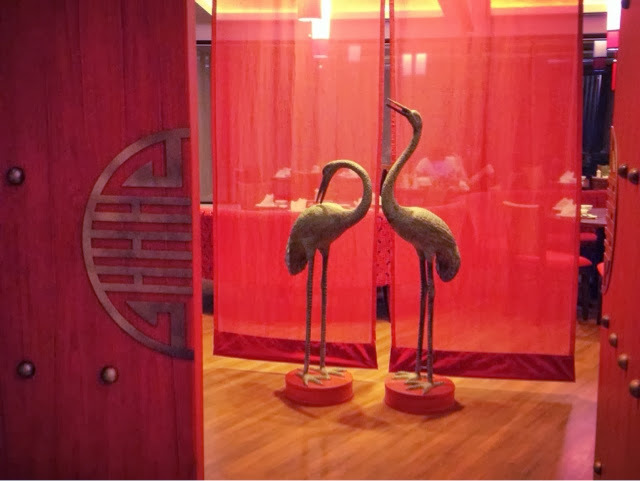 Out of all restaurants in the hotel, Hai Sang Lou was our favourite. The service was top notch and Sook Chan in particular, an always smiling Malay-Chinese, took very good care of us; so I promised I would mention her name as a thank you. The food was some of the best Chinese I've ever had, soft shell crab and black chicken soup were our favourites. 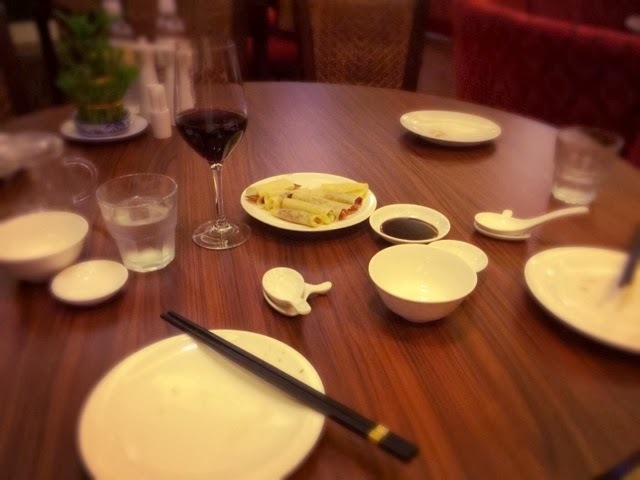 You can order a whole crispy duck, they carve it at your table, using the crispy skin for pancakes as a starter and then you choose between black pepper or lemon sauce for the duck meat to have as a main with rice or noodles. 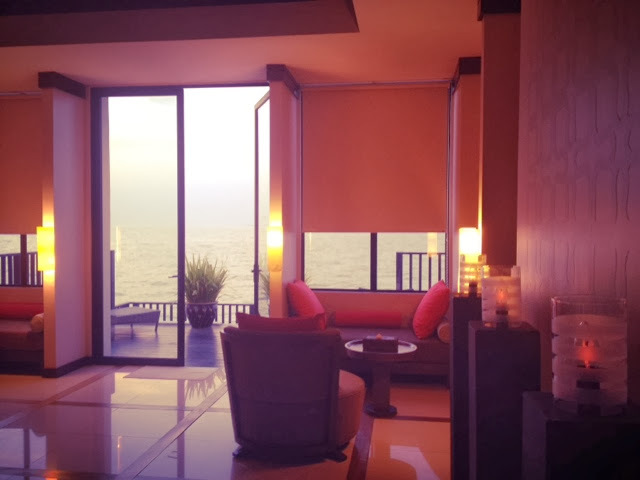 Along with a glass of white wine and fully air-coned space, it makes for a great evening over the sea! Selat Bar was also a fun alternative, very different ambient though. 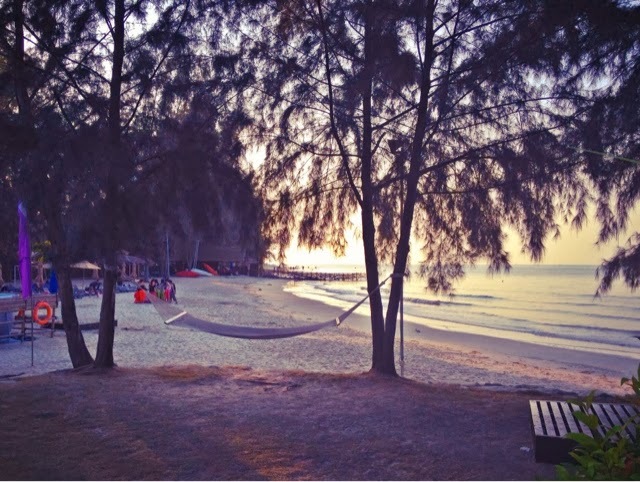 Right on the beach, informal and equipped with a karaoke machine and a pool table. My chatterbox husband managed to get himself behind the bar and taught the guys there how to make an espresso martini; so if you go, ask for one, it's not on the menu but they'll make it for you because they took notes! What for a beautiful sunrise ! I've never been to Malaysia but it looks great. And now the barmaids know how to do expresso martini, that makes two good reasons to go there !